When nearly half of all Americans do not know a Muslim and 80 percent of news coverage about Islam and Muslims in the United States is negative, there is a lot of misinformation. 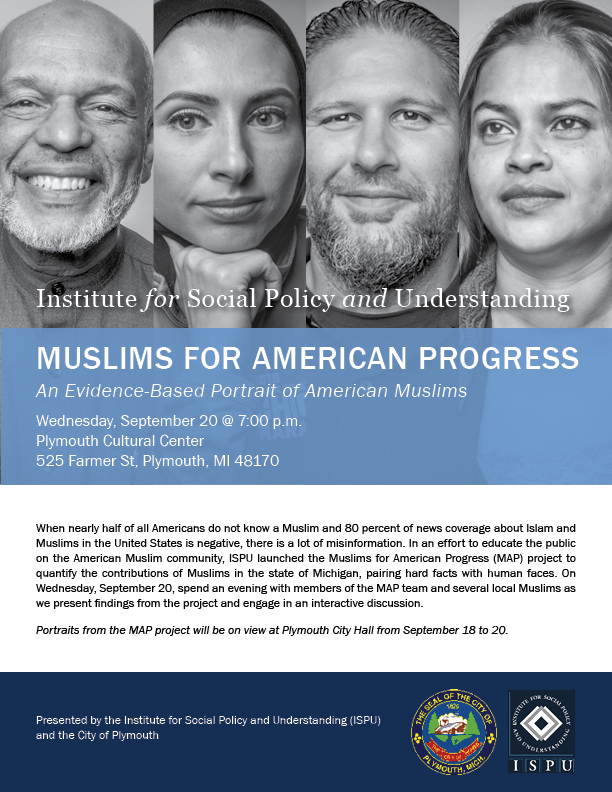 In an effort to educate the public on the American Muslim community, ISPU launched the Muslims for American Progress (MAP) project to quantify the contributions of Muslims in the state of Michigan, pairing hard facts with human faces. On Wednesday, September 20, spend an evening with members of the MAP team and several local Muslims as we present findings from the project and engage in an interactive discussion. Portraits from the MAP project will be on view at Plymouth City Hall from September 18 to 20.